I’ve had the pleasure to experience a range of design hotels. Now that I’m back, I have decided to share them with you, and take you through my adventure. My journey started in San Francisco at a group of 24 lodges nestled along the bay side – Cavello Point. Horseshoe Cove was home to Fort Baker before the Golden Gate Bridge had been built, so the stunning bridge just adds to the already beautiful views at this award-winning resort – further enhanced during my visit with fog rolling down from the hills behind. While they are famous for historical preservation of the fort, you can tailor your experience with contemporary or historic lodging and all options come with today’s amenities and top quality service. The Spa was ranked 4th in the US in a recent award but offers more than just facials: it is a healing arts centre with a meditation pool, open fireplaces, a tea bar and library – a full mind, body and soul experience. A wellbeing weekend at Cavello Point starts from $1485 per person, a night in a Historic Queen bed room starts from $421.52 per night. Reservations can be made through the Cavello Point website. Wondering how anywhere could match the serene luxury of Cavello Point, I collected a convertible car and drove on the iconic Highway Number 1 to my next destination – Carmel Valley Ranch. Enjoy the view from your tub! I was spoilt with views on this trip, and the heart of the Santa Lucia Mountains was no exception. There was no longer fog affecting the view across the ranch, and my immediate thoughts were that this place looked like a lot of fun. It was 500 acres dedicated to the idea of play, and you can personalise that experience to be as active or a lazy as you like – anything goes, from bee keeping to stargazing, archery to wine tasting, and they cater for all ages. Accommodation focuses on comfortable luxury and exploiting the fantastic views. Many rooms have fireplaces and a few have outdoor tubs, so you can ease the muscles after a busy day with a glass of local wine looking over the valley – bliss! Rooms at Carmel Valley Ranch starts from $400 per night for the hot tub suite as pictured. 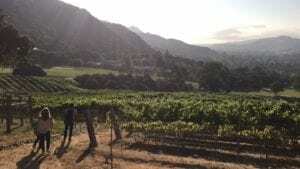 Go and explore the whole experience in more depth, available at the Carmel Valley Ranch Website. 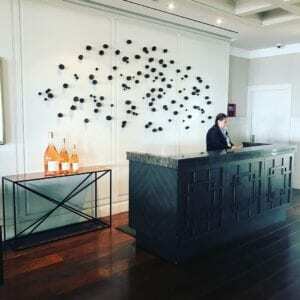 With still so much to explore at Carmel Valley it was time to set off again, this time to Santa Barbara for a Forbes 5 Star experience at the Belmond El Encanto resort. 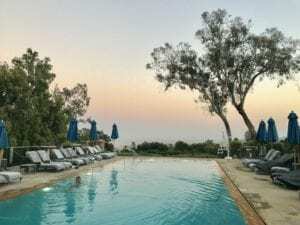 The landmark 1920’s Hacienda style resort sits high in the hills amid lush gardens, offering a dazzling view over Santa Barbara and the sparkling Pacific Ocean. It has been brought back to life with modern additions such as an expansive outdoor swimming pool and a wonderful boutique spa. It is without a doubt that Belmond El Encanto have managed to meticulously combine the romance and glamour of the Santa Barbara community, with the laid-back attitude of the Californian style. The accommodation ranges from bungalows to suites, with a focus on serenity and privacy, it is the perfect place for a retreat. The room style is traditional and many original 1920’s features remain, including huge fireplaces and wooden floors which add to the classic elegance of your stay. 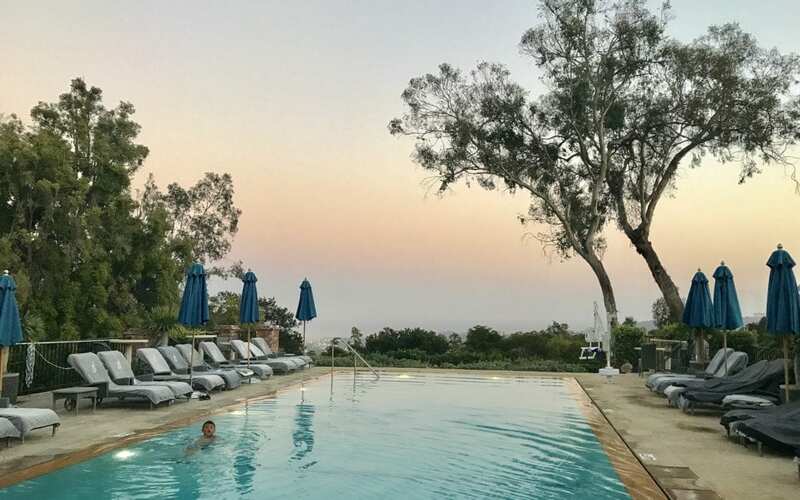 If you are looking for a romantic retreat away from the world then this is the perfect spot for you, with rooms starting from around $400 per night: Belmond El Encanto. From a bay to a valley to a hill, my final destination is a beach resort – the Viceroy Santa Monica Hotel. This hotel describes their experience as Salt-Air-Kissed Sophistication and I certainly could not argue with that! I might be slightly biased as the interior has been designed by my favourite female designer, Kelly Wreastler, but she has created a monochrome foundation enhanced by green accents that makes for a fresh and crisp aesthetic. Her designs truly complement the stunning sea views. She has used strong colours around the hotel, I particularly loved the bright yellow chairs in the library, while keeping it simple – there are a lot of design elements here all working in perfect harmony. Because of its proximity to the famous Santa Monica beach, the area is a great location for artists. If you are into cool Californian jewellery, clothes and organic cafes, then I truly recommend strolling down the Kinney Boulevard. Rooms start from $460 per night. For more information on both price and offers see their website at Santa Monica Viceroy. 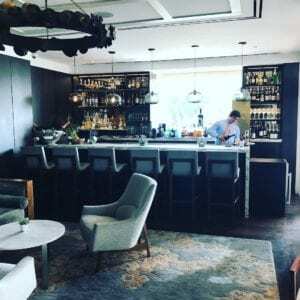 What a whirlwind of experiences, each location had a very different atmosphere and focus but managed to impress with quality, service and interior design choices. I came away with a few ideas – although I’m not sure I can fit a hot tub in my bedroom – but to spending time living in different approaches to luxury accommodation was fascinating and I look forward to planning the next trip. View our instagram account for more pics! Click the link below to see a short video of these interiors.